Why We Chose HubSpot as Our All-in-one Marketing Tool! Why We Chose HubSpot as Our All-in-one Marketing tool? As smart marketers in the modern age, all of us would unanimously agree that Inbound Marketing is one of the most effective forms of marketing. And HubSpot is the one to spark this global movement! Hubspot incorporated inbound marketing into their marketing strategy and helped other businesses to achieve their business goals quickly and more efficiently. There’s a simple 5 step mechanism that we recommend you to follow in order to make an informed purchase and choose a marketing automation platform that is a perfect fit for your business needs and goals. You can also read about it in details here. First things first - You need to decide whether or not your business really needs a marketing automation platform. Identify and contact appropriate vendors that you feel can satisfy your business needs. Schedule demos with them and check for their references before you actually think of negotiating a contract. HubSpot is an easy to use and highly intuitive all-in-one inbound marketing software. It allows you to know who is visiting your website and is currently on which page enabling your sales and marketing teams to tailor their efforts for quick conversions. Helps you monitor when your prospects last visited your website. You can also monitor how much time are they spending on each page. This ensures you get a feedback on the success and gives you a scope to improve your marketing programs. Sends instant automated notifications when your prospects visit the pricing page so you can connect with them to discuss the deal further. 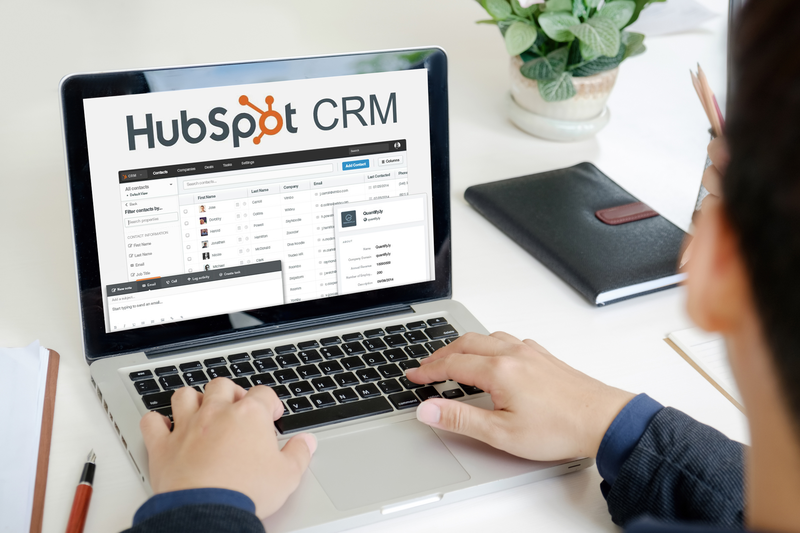 HubSpot has its own CRM Pro and HubSpot Sales Pro is a sales automation tool. It also offers excellent integration capabilities with InfusionSoft, Salesforce, Pipedrive, Zoho, Insightly and many more. Let’s you publish, monitor, track and analyze social media activities and campaigns for improved traffic. Helps you send automated, yet personalized emails. You can nurture your leads through drip marketing- sending relevant emails and offers depending on their source and other factors. Lets you filter the prospects based on various metrics and send automated follow-up emails to each of them. In-built SEO analysis of your blogs, which is real-time. This enhances the quality of the blog and increases readership and views. HubSpot’s all-in-one marketing software is free to start with and its support is great, you get answers to your queries promptly and in an organized manner. “Okay, so HubSpot is good, but how do you say that it’s better than the others?” If this is what you’re thinking, then here’s what you need: A one-on-one marketing automation tools comparison between HubSpot all in one marketing software and the next top 5 marketing automation tools! Both HubSpot and Act-On marketing automation platforms are easy to use, but HubSpot is highly intuitive. One of HubSpot’s wow factor is that you don’t need web designers/developers or IT specialists in order to operate it or to create stunning web pages, landing pages or offers. Act-On specializes in custom solutions for companies and their list maintenance programs are phenomenal. They help you score, sort, clean and distribute leads based on their quality and behavior. HubSpot allows you to integrate all your social media channels, automate publishing & monitoring. Act-On allows easy integration with many different CRM systems. Its integration capabilities with Salesforce CRM are exceptionally good. Act-On allows you to publish on social platforms, but the monitoring feature is not available as yet. HubSpot provides great analytics and reporting tools for you to run your marketing campaigns successfully. Act-On earns kudos in terms of their quality of support! For more details, read here.. Although Eloqua is a little complicated and not easy to integrate, it does integrate easily with products and platforms from Oracle. It supports only mobile websites. HubSpot offers exclusive content management features like blogging, strategy & lead flows. It scores brownie points for its user-friendliness and is packed with effective features like workflows, drip marketing campaigns, lead nurturing, analysis and reporting. Then again, Eloqua offers great email marketing features like customizable email templates. Also, pre-designed templates for landing pages. One of its features that enables the marketers to display personalized greetings based on the prospect. Eloqua doesn’t offer a very detailed approach for contact management and content management like HubSpot, thus lacking insights on the prospect to customer conversion and makes it difficult to create relevant personalized content for different prospects in different stages of the buyer’s journey. The key aspects of the contacts like social media interactions in the contact records are not incorporated into their analysis section. For pricing and other details, read here..
Apart from its intuitive interface and excellent integration capabilities, HubSpot offers you a dedicated training and onboarding in all its plans. The onboarding packages depend on the marketing automation package that you choose, but it’s not available for the free and starter package. Infusionsoft offers a 30-day training program as a part of all its packages. Infusionsoft will help you set up your first campaign for free. You can then choose paid gold or platinum plans or additional packages for further campaigns. Infusionsoft also provides eCommerce features like the shopping cart and order forms. HubSpot lacks here. But you can integrate your eCommerce site into HubSpot with the help of HubSpot App Marketplace. With respect to eCommerce, HubSpot has a specialized consulting team that focuses on the success of their eCommerce customers. Infusionsoft offers built-in billing and reports for sales, payments, revenue, receivables and other reports. For details on interface and pricing, read here.. The basic features of both the platforms are quite similar, but HubSpot excels in its content management tool. The features like custom reporting which help you to measure metrics that are required specifically for your business to determine the campaign’s success or failure are provided by both the platforms. You can choose the metrics of your choice and generate custom reports for measuring your business’ productivity and ROI. HubSpot’s basic marketing package provides limited lead nurturing features, but it’s focused on list segmentation, which is good. The features like real-time updates on your prospects, automated follow-ups, book meetings and live chats are available in the paid packages. With the advanced professional or enterprise package, you can have access to important features like event-based automation triggers, branching logic, sales notifications, automation templates, and much more. Pardot offers basic lead nurturing and scoring capabilities. It does not provide any SEO functionality, doesn’t support event management automation and requires technical expertise and training. 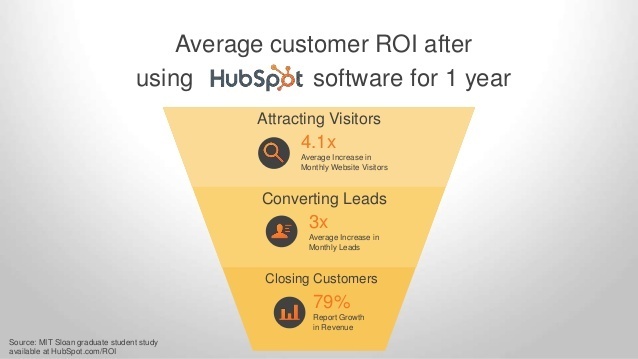 For more information, read here..
HubSpot is an all-in-one inbound marketing software. From building your website to driving leads and closing them, HubSpot provides an all-around solution for all your needs. It does not require you to have web designers or developers or IT specialists in order to operate it. Marketo, on the other hand, specializes in custom solutions for companies and makes it necessary for you to have someone with prior IT knowledge to design and develop website pages, landing pages, forms, etc. Marketo’s lead nurturing capabilities are almost as good as HubSpot. It helps you drive more top-of-the-funnel activities, improve your lead quality, convert leads with landing pages and progressive forms. You can help your sales team to close more deals through tracking & analytics across all of your channels. Marketo provides deeper insights for lead nurturing as compared to HubSpot for enterprise companies. For detailed comparison,read here..
Act-On is for all small to large businesses and specializes in customized marketing automation packages. Pardot is a preferred choice for large organizations with big budgets. Eloqua is an efficient marketing automation tool but requires, technical expertise and training for seamless integrations and functioning. Marketo is suitable for large enterprises with big budgets who can handle complex integrations and automation functions. Infusionsoft is Ideal for small businesses who want to build their marketing strategy and scale their business faster. Although all of these marketing automation companies are good in their own ways, none is an all in one inbound marketing based automation platform with easy integration features like HubSpot! Need a quick comparison chart for the top 5 marketing automation tools? Here’s an in-depth marketing automation tools comparison! 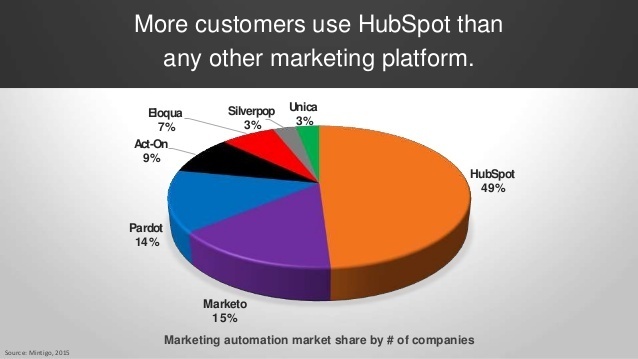 This was the comparison of HubSpot with the top 5 marketing automation tools. If you need to know about the other marketing automation tools available, before you zero in on the ideal marketing automation tool for your business, you can find them here! Apart from Hubspot, Pardot, Marketo, Infusionsoft, Eloqua & Act-On, you’ll get to know about LeadSquared, Salesfusion, OutMarket and Net-results as well. Check their lead driving capabilities - An marketing automation vendor needs to help you build standalone landing pages without the distraction of site menu, also forms that are integrated with your website to improve its reputation with the search engine. Contact data management - Ideally, using the data should be easy to view and use. Unlimited form fields and populating any number of segmented lists should be possible. It should be easy for you to download the data for your sales team to follow-up through your CRM system. Detailed Contact Insights - Check if you can track all the page views by different visitors, the engagement of each visitor and score it based on a different criterion, the increase or decrease in the engagement. Conversation Personalization - Ensure if you can - send different personalized messages to different lists, create personalized journeys for individuals, send automated follow-up emails, treat known contacts differently, trigger a sales call rather than an email, and even stop the journey according to the user actions. Marketing & Sales Triggers - You need to ask your vendor whether they can trigger different emails, sales tasks and break them based on different factors like - Time lapsed, emails opened, blogs read, links clicked, demographic data, location, web page visited, level of engagement, level of inactivity, etc. User Friendliness - An marketing automation tool needs to be easy to use and intuitive for your marketing team that’s going to use it. Integration Capabilities - You need a marketing automation platform that offers sales & marketing alignment, website, blogging, CRM, analytics, all in one box. Technical Support - See if you can actually speak with a real person and if they operate in the same business hours as yours. Location of serves can play a vital role in the loading of your web pages and directly affect your search engine rankings. The scope of Customization - if you don’t think all your needs are met by a certain package, try to negotiate a deal and see if they can add on some of the facilities and make enhancements in the package. Competitive Pricing - The best way to compare pricing is to make a 3-year cost estimate including all the costs and then zero in on the most appropriate one. To know more about the comparison factors in details, read here..
Will ongoing training programs be charged extra? For a smart marketer, who needs to both maximize yet simplify the marketing efforts, Hubspot is definitely your one stop shop! HubSpot helps to make a marketer’s life easier while continuing to grow your business and delight your customers. It’s free to start and also available for $50 per month for small companies that want to capture, track, and convert leads for free. Their most suitable all-in-one marketing software (link to our software page) that grows with your company starts from $200 per month. How Prodigitas Can Help You? Getting started with Hubspot may take a considerable amount of your time and efforts. This is where the HubSpot certified marketing automation experts at Prodigitas are here to help you! From your business need analysis, help with onboarding to on-demand and ongoing consulting, technical services to finally providing an all-around Support, we’re here to help you throughout the process and even after that. We are marketing technologists at the core and it is our mission to equip modern SMB and SME marketers with the right technology, strategy, and services to enable business growth. We help you maximize the benefits of implementing a Marketing Automation Software and drive revenues through improved lead conversions. As a HubSpot agency partner in India, we provide marketing technology for B2B businesses primarily helping them adopt HubSpot and also offer allied services like - HubSpot Onboarding, HubSpot Launch, HubSpot Management & Inbound Marketing. Our HubSpot specialist will work with you to set up HubSpot all in one Marketing, HubSpot Sales Pro & HubSpot CRM Pro for B2B businesses as part of the HubSpot Onboarding Package. Connect with us for a HubSpot Sales Pro demo, will also help you with HubSpot ERP. In addition to the basic setup, we will also help you with the HubSpot Launch and work with you to align your HubSpot experience in line with your business goals and objectives. Our HubSpot Management package will help you in managing the day-to-day tasks including HubSpot onboarding, landing page creation, building CTAs & forms, defining workflows, email marketing, list management & segmentation, on page optimization, tracking, reporting & much more. As part of our Inbound Marketing package, right from strategy to content production to HubSpot management, we will do it all for you. Connect with our marketing automation expert! Are you looking to boost leads and bring in more revenue? 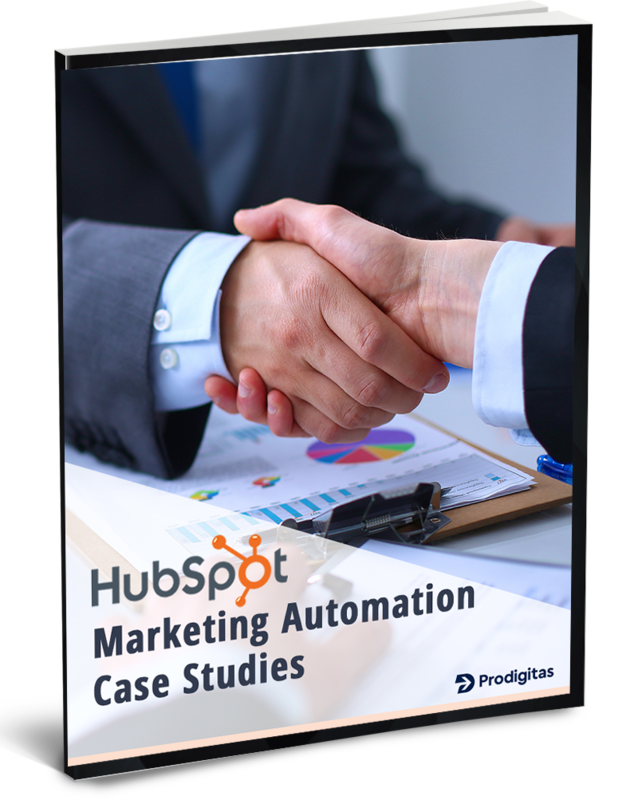 Download our free ebook to see the success stories of 5 businesses who achieved phenomenal results with HubSpot marketing automation. Prodigitas is one of the very few digital marketing agencies in India that offer Inbound marketing and Hubspot services. Our team is geared to offer the full range of Hubspot services and has been trained by Hubspot.